It is said that a picture is worth a thousand words and good graphics are a vital component of disseminating research. During the APECS International Polar Week Fall 2016, we are organising a figure competition, where everyone will be able to vote for the most eye-catching, informative and inspiring figures. We are looking for figures in the broadest sense of the word (infographics, cartoons, figures for journals etc.) which capture either the overall theme of your research or a particular finding in pictorial format. Entries may be submitted with a caption, but please try to keep text to a minimum. If you want to participate by sending a figure, send it to polar-weeks@apecs.is and we will upload it for you on our website. What to submit for each picture? Caption (if needed). If the figure is already published please send the source link. Ensure colour scheme is suitable for the colour blind. Refer ColorBrewer 2.0 for colourblind friendly colourmaps. Voting has now closed to see the winning entries click here! Click on the figure in the table to view a larger version. 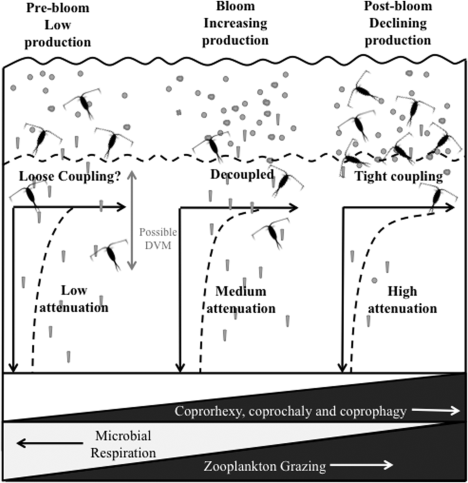 8	 Ruth C. Heindel	 Dartmouth College	 Conceptual framework for understanding the role of biological soil crusts (biocrusts) in the West Greenland landscape. 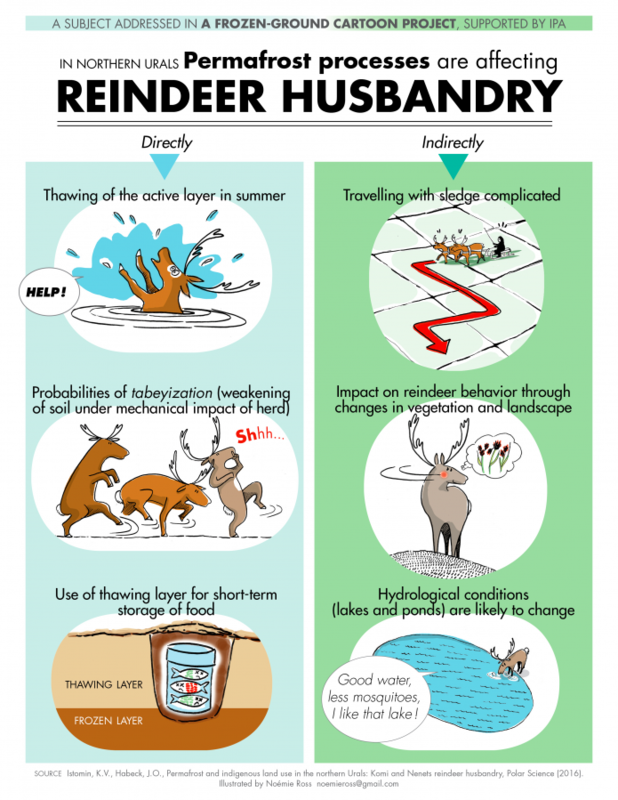 Starting in a high productivity stable state (shrub and graminoid tundra), wind disturbance can remove soil and vegetation, exposing loess and glacial till. 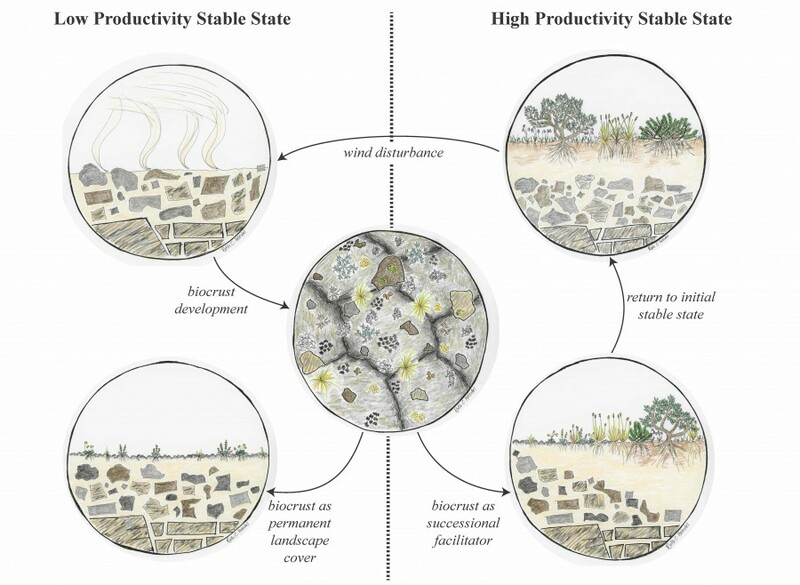 After biocrust development, the role of the biocrust either as a permanent landscape cover or a successional facilitator determines whether the landscape remains in a low productivity stable state or returns to the initial high productivity state. Concept from Bowker et al., 2007. 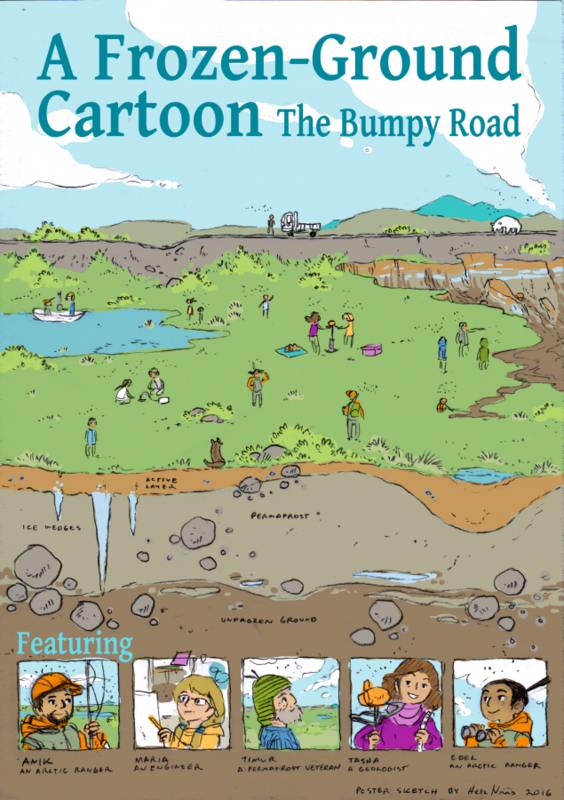 ‘A Frozen-Ground Cartoon’ is a scientific outreach project presenting permafrost research conducted in the field with thematic comic strips. 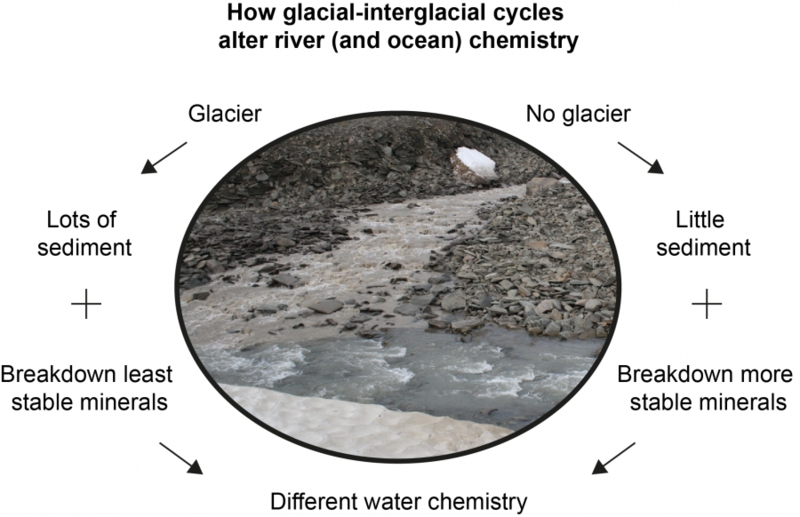 It is coordinated by a core group of Permafrost Young Researchers from Canada and Europe and is funded by the International Permafrost Association (IPA). This poster is realized by Noémie Ross, a professional young artist from Montréal, Canada. For more information click here. 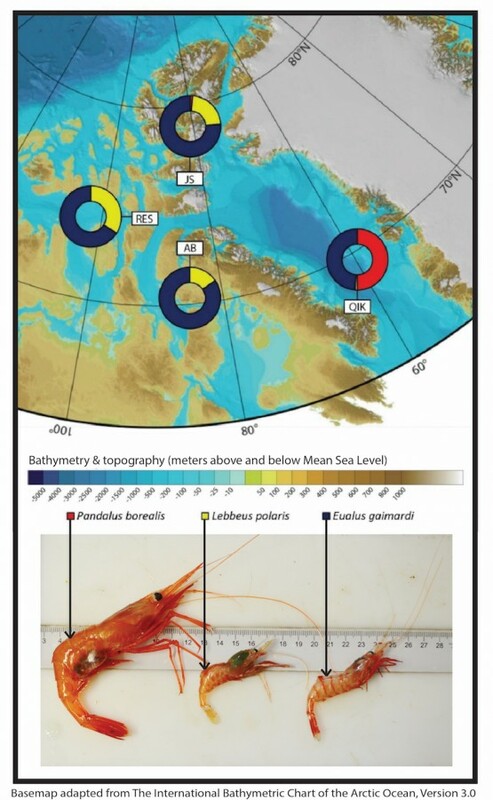 5	 Anna Belcher	 National Oceanography Centre Southampton	 Schematic to illustrate the mechanisms contributing to flux attenuation in the upper mesopelagic in the Scotia Sea, Antarctica, and the influence of bloom phase on these mechanisms. 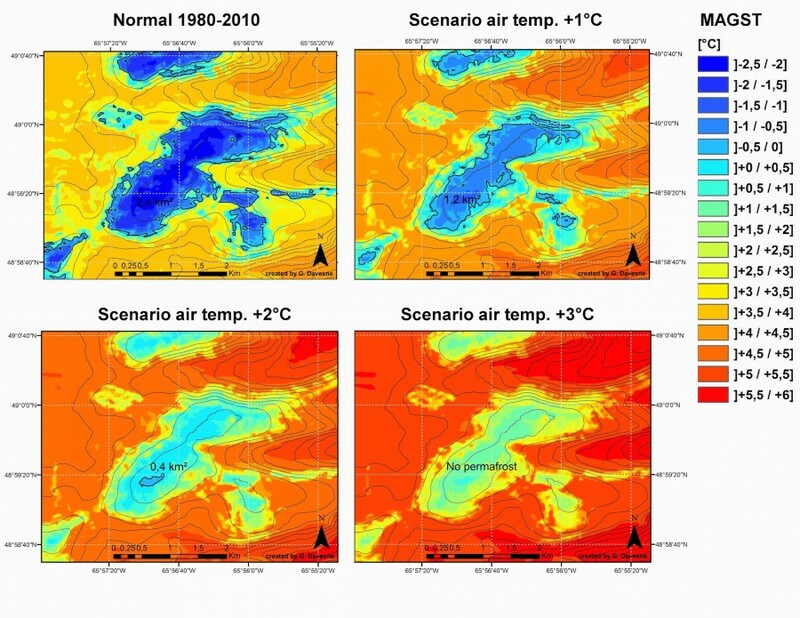 Spatial modelling of the mean annual ground surface (MAGST) on the plateau of Mont Jacques-Cartier (Gaspé Peninsula, Quebec) according to the mean annual air temperature (MAAT) for the 1980-2012 normal period ; and for 3 scenarios of MAAT rise (1 °C, 2°C and 3 °C warmer than the normal). The black line represents the 0 °C isotherm, which delimits the areas with favourable surface conditions for permafrost preservation. 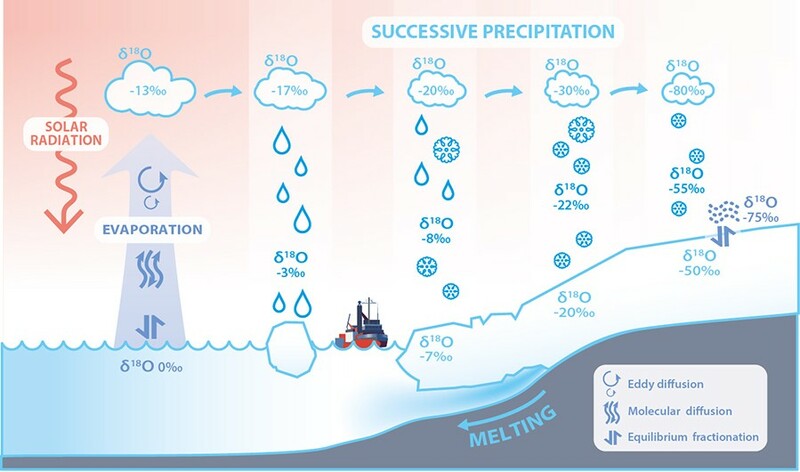 Note that the “+1°C scenario” is close to the current conditions. 2	 Joanne Heslop	 University of Alaska Fairbanks	 Vault Lake, Alaska, USA (65.0293 N, 147.6987 W) morphology shown in cross section along the long axis of the lake. Height of the thaw bluffs was measured using differential GPS (DGPS). Depth of the Vault Lake talik was measured using the delineated borehole transect. Thaw bluff heights, lake depth, talik depths, and distance between boreholes are shown to scale. 4	 Alice Bradley	 University of Colorado Boulder	 Sea ice thickness distributions derived from IceBridge ice thickness retrievals from a flight on March 21, 2013. The left panels show how the ice thickness distributions change from predominantly thermodynamically-grown first-year ice on the top (dark green) to highly deformed multi-year ice (light blue). The right panel shows the locations along the flight track where these thickness distributions were calculated superimposed on the estimated sea ice age in that location.